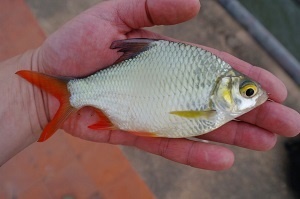 The Red-tailed Tinfoil Barb or Barbonymus Altus is one of Thailand’s smaller carp species which is widely distributed throughout the Mekong and Chaophraya basins in Laos, Cambodia and Vietnam. Red-tailed Tinfoil Barb inhabit most large rivers in Thailand and venture into inundated flood plains and riverside pastures in the raining season. This lesser known Thailand carp species has a flat streamlined body covered in minute silver to gold coloured scaling with red to orange fins and tail. The Red tailed Tinfoil Barb feeds on a mixed and varied diet of small fish, invertebrates, plant matter, organic detritus and algae and can be easily caught with light tackle at rivers such as the Bang Pakong and Maeklong River.